With hints of cool air making sneak appearances in the mornings lately, I’m getting antsy for fall. Enough with the humidity and mosquitos and onto apple cider, crackling fires and cozy sweaters! Since that might be a little premature still, I satisfied my autumn itch by making a fall wreath for my front door. Every year I see pretty wreaths all over retail-land…for beaucoup bucks. I have a hard time justifying $50+ for a wreath, even if it is reusable. So with the fall florals on sale at the craft store last week I was suckered into a bagful of scarlet faux berry branches (which my nature-loving husband informed me are staghorn sumac replicates) and wreath supplies for a total of about $18. I had never tried to make a wreath before but it turned out to be SUPER easy. Use the wire cutter to clip off the individual sumac branches from each bunch. Push each branch in between the branches of the wreath, working so that the branch tips point in the same direction. Try to push each branch in as tightly as possible. Cut two strips of burlap, approximately 3-4 inches wide. Tie one into a large, loose bow and set aside. Wrap the other around the wreath as a hanger. Match up the ends of the strip and fold over. Use safety pins to affix the bow onto the burlap hanger strip, lining it up with the wreath itself. Then, use a simple running stitch to secure the fold, sewing about 1/2″ from the edge. * Note: You may need more or fewer branches depending on the floral you use and the look you’re going for. Very nice Katie… I really like the look of the burlap bow and hanger. It adds to the rustic fall feel. This is adorable! I too am a huge fan of the Fall…what a great way to bring in some seasonal decor on the cheap! Love the burlap–sets it off nicely and gives a natural feel to it. Thanks for sharing! That is so cute! I love the big bow and the simplicity of the single type of berry. I wasn’t sure if I’d be able to make my own but now I think I might be able to. 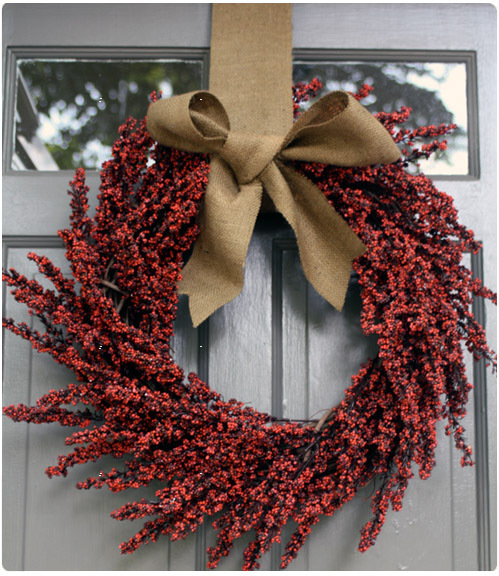 I love this beautiful fall wreath! My favorite is the red floral branches. They make the wreath look so elegant and classic with the big brown bow – not too fancy. I’ve done similar craft projects and posted on http://www.makemania.com Take a look at mine and feel free to promote this fantastic craft project from your blog! Love it! That is absolutely something you would find in a store….for a lot more than $18! Wow, this looks really professional! And you would probably pay twice as much to buy it ready made! I know this is an older post, but did you use real/live floral branches for this wreath…or were they artificial? 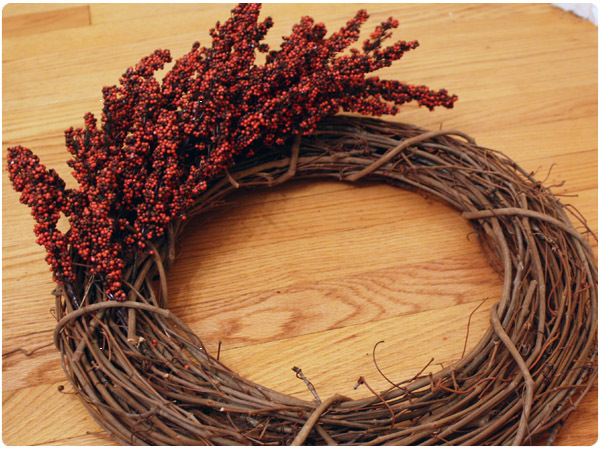 Hey Kristin – I used fake branches from Michaels so that I could use the wreath year after year. @Laurin – Hi! It is burlap…or at least that’s what it said on the fabric bolt! I bought it at Joann Fabrics so perhaps their burlap is more “fabric-y” than utility? How did you get the wreath to stay up? I’m a little confused on how to make it stay. @Nicole – an easy trick actually! I folded over the burlap at the edge of hanging portion and then used thumbtacks to tack the burlap onto the top of my front door. About three thumbtacks does the trick.